Every brewer dreams of making a brewery uniquely his or her own, and Fletcher is no exception. Fletcher’s real love in brewing comes from the production of oak-aged beers and according to Fletcher, Anchorage Brewing Company will produce only 100 percent barrel-aged, all brettanomyces-influenced beers that will be produced strictly in 750 ml wine-style bottles with cork and bail finish. Fletcher’s reputation has helped to land him a spot in the portfolio of Shelton Brothers Importers (only the third U.S. brewery to do so), which will give him instant distribution across the country. But, he’ll be producing at small volumes and you’ll likely have to pay attention in order to land these releases. Fletcher hopes to have his first release out by February 2011. Check out the entire article for more details. Ben Johnson will take over as head brewer at Midnight Sun, and I’m guessing things won’t skip a beat. I’ll be looking forward to great beers from both breweries in the future. Two or three years ago, after tasting Midnight Sun and being right royally entertained behind the scenes by Abe, Darnarly was the only more noticeable event in Alaska . OK , the train observation carriage was super as was the sea passage in a small cruise ship (but they both only served common old garden non IPA swill. They had an amber that was local but bereft of any hop attampt) . 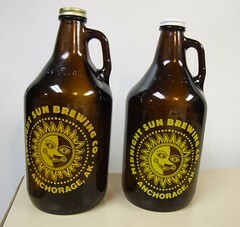 On the other hand – oh heck – Anchorage has what must be one of the world’s most intriguing and excellent breweries so who needs all those other diversions such as otters, wolves, bears, nameless and other hairy or non hairy things that glug, squirt water and dive ? We need them as spending hours looking for them and then seeing them gives one a thirst! So get with nature and drink IPA. Abe is opening his new brewery far too late for this visit in 2010 so on September Friday 3 I intend to see how Ben keeps the living legend going. I hope he will be there. – late Friday – airport to brewery – no diversion – but maybe he has a home to go to. OOOOh – I cant wait. That IPA – Sockeye Red or some such name – full fruity brimming with hops – Cascade fruitiness and maybe Simco, no room for malt . IBU,s maybe 75? I seem to recall it wasn’t overpowering with alcohol so maybe I drank more than I should – and that’s why ones needs a wife – commonly called a designated. When Abe opens his brewery – will there be any reason for people in Anchorage to be sober with two breweries producing full scintillating beers?